To understand the factors that induce floral senescence in Hibiscus syriacus L., we have investigated the effects of various chemical agents on flower senescence at two different flowering stages, before and after full bloom, as well as the relationship between flower longevity and endogenous ethylene production before full bloom. Treatments with ethylene, 1-aminocyclopropane-1-carboxylic acid (ACC), and ethephon enhanced floral senescence, while aminoethoxyvinylglycine (AVG) promoted flower longevity regardless of treatment timing. Although ethanol slightly extended flower longevity, abscisic acid (ABA), nitric oxide, boric acid and sucrose, which have been reported to affect flower longevity or senescence, had no effect on H. syriacus floral senescence. The polyamine spermine (SPM), methylglyoxal-bis(guanylhydrazone) (MGBG), an inhibitor of SPM biosynthesis, and cycloheximide (CHI) accelerated flower senescence when applied before full bloom, but had no effect when applied after full bloom. 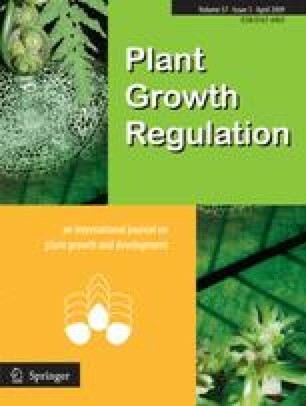 SPM, MGBG and CHI treatments resulted in enhanced ethylene production during flower opening, and the promotion of flower senescence is mediated by ethylene production prior to full bloom. Furthermore, endogenous ethylene, spontaneously produced before blooming, was closely associated with floral senescence. These results suggest that ethylene production during flower opening plays a key role in determining the timing of Hibiscus flower senescence.